Notification Center makes more sense like this. Notification Center on the iPad isn’t that great. It functions just like the iPhone, meaning you pull down a window from the status bar to see your notifications. While that interface works nicely on the iPhone, the window isn’t scaled appropriately to the iPad’s larger display. In OS X Mountain Lion, Notification Center makes more sense on a larger screen. Instead of coming down from the top of your Mac’s display, your notifications are displayed on the side of the screen. 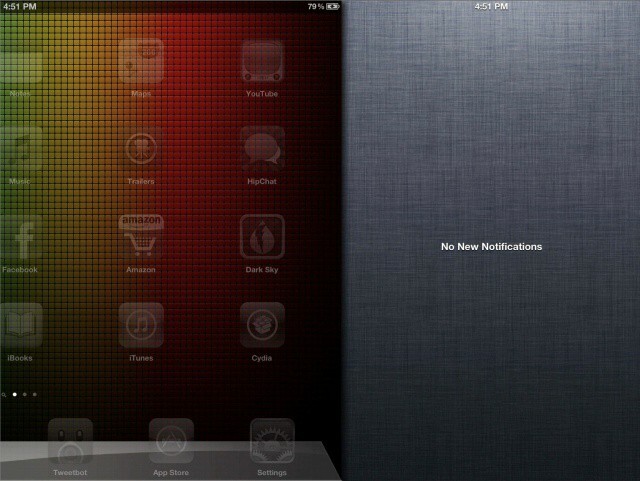 Want that type of Notification Center interface on your iPad? A jailbreak tweak called MountainCenter will make it happen. 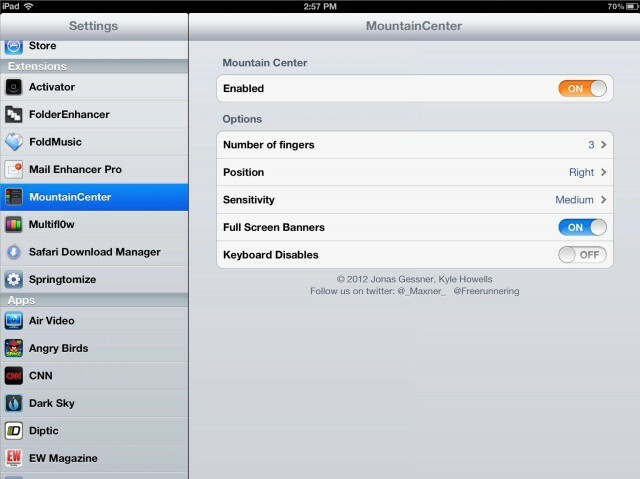 Once you install MountainCenter in Cydia on your jailbroken iPad, enable the tweak in the Settings app. The options are relatively simple. Like Mountain Lion on the Mac, MountainCenter places iOS’s Notification Center on the side of your screen. You can choose if you want it to be the right or left side. For a Mac-like experience, choose the right. You can select how many fingers to use when swiping to reveal Notification Center. I found three fingers to be the most practical. You don’t want to conflict with similar swipe gestures you may use in other iPad apps. The tweak’s sensitivity level can also be tweaked for how easy it is to trigger Notification Center. Full Screen Banners make Notification Center banner messages use the full length of your iPad’s status bar, which is a great addition to the tweak. When Notification Center is open, the Keyboard Disables toggle will hide or show the iOS keyboard if it’s open in the currently running app. For $3, MountainCenter isn’t exactly cheap, but it’s the most full-featured and stable Notification Center enhancement tweak on the iPad. If you want something for free, try the similar MountainLionCenter in Cydia.